The seasons are changing in many parts of the world right now, but what really is changing this autumn is how the world is looking at renewable diesel. Phillips 66 and REG’s announcement about a new renewable diesel plant on the U.S. West Coast planned for 2021 comes after a notable increase in refineries that are being converted and changed over to renewable diesel. Change is good, especially in this case. Maybe Dylan’s song is playing in the corporate offices of Texas-based Phillips 66, a former petroleum focused energy company, as they see the value of change by partnering up with one of the largest producers of advanced biofuels – Iowa-based Renewable Energy Group. While it was over a year in the making, they announced last week that planning is underway for the construction of a large-scale renewable diesel plant that will utilize REG’s proprietary BioSynfining technology for the production of renewable diesel fuel. Planned feedstocks include a mix of waste fats, oils and greases, including regionally-sourced vegetable oils, animal fats and used cooking oil. If approved, production at the new facility is currently premised to start in 2021. The new facility would be constructed adjacent to the Phillips 66 Ferndale Refinery in Washington state. The Ferndale Refinery is a perfect spot with existing infrastructure, including tank storage, a dock, and rail and truck rack access and happens to be a hot spot for this type of project with a Mercurius biorefinery nearby. “The proposed facility’s strategic location in Washington state would enable us to move renewable fuels more efficiently to support West Coast and international fuel market demand,” said Brian Mandell, senior vice president, Marketing and Commercial, Phillips 66. Phillips 66 isn’t the only one converting from petro-based diesel into biodiesel. Several others are keeping up with the changing times and moving towards more sustainable diesel. In fact, World Energy announced a $350 million investment over the next two years to complete the conversion of its Paramount, California facility into one of the cleanest fuel refineries in the world, as reported by The Digest in October. The project will enable World Energy Paramount to process 306 million gallons annually. The conversion to renewable jet, diesel, gasoline and propane will reduce both refinery and fuel emissions while supporting more than 100 advanced, green economy jobs. Another conversion is underway by Andeavor (now joined with Marathon as of October 1st and known as Marathon Petroleum Corporation). As reported by The Digest in August, Andeavor is converting the North Dakota Dickinson Refinery to process 12,000 barrels per day of renewable feedstocks, including soybean oil and distillers corn oil, into renewable diesel fuel. The project is expected to be completed in late 2020 and is subject to permitting and regulatory approval. 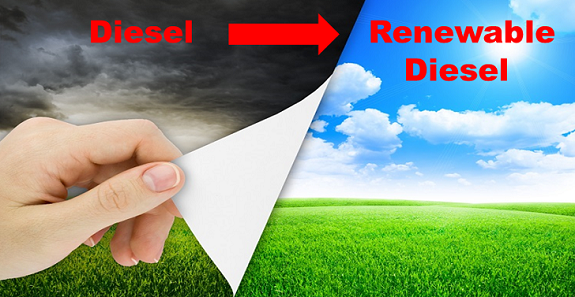 ENI is another petroleum company that switched to renewable diesel. While it still is an oil and gas company, Eni expanded into renewables with its Venice biorefinery in Italy a few years ago which was renovated by UOP to produce renewable diesel. Eni is even supplying the city of Venice and their waterbuses with its E15 Eni Diesel+ which is part produced from UCO collected in the city. Eni must be doing something right in the renewable diesel space since the Indonesian government is now collaborating with ENI to see if it’s feasible convert Pertamina’s Plaju and Dumai refineries into biodiesel production facilities, as reported in The Digest in October. Both refineries were built in the 1930s with refining capacity of 133,700 bpd and 170,000 bpd respectively. Conversion of refining production capacity into biodiesel production is becoming more common in Europe with both ENI and Total having done it or are currently in the process of doing it, such as Total’s La Mede refinery in France. Neste is expected to decide by December as to whether or not it is sticking to an internal deadline of December to make its investment decision about the potential new aviation biofuel production facility in Singapore. As reported in The Digest in October, the company already produces biofuel in Singapore but increased demand for renewables spurred by the most recent IPCC report and Norway’s 0.5% aviation biofuel mandate has given further impetus to the project that the company has already spent “tens of millions” developing. In November 2017, the Digest reported that Valero and Darling Ingredients were looking at doubling Diamond Green Diesel production from 275 million gallons to 550 million gallons at the DGD facility in Norco, Louisiana. Why? They are looking into the future through their crystal ball…in anticipation of growing demand for renewable diesel due to the RFS and global low carbon markets. This comes on the tail end of their most recent expansion where they went from 160 million gallons of renewable diesel to 275 million gallons in annual production capacity. Though they had to replace a catalyst that was damaged recently which will lower 3rd quarter projections, they expect to go back to 275 million gallons rated capacity very soon. Renewable diesel is a low carbon and low sulphur fuel, making it an attractive investment for any company looking to lower their carbon footprint, whether it’s because shareholders are pushing for it, local or state mandates are demanding it, or consumers are requesting it. If you aren’t convinced about renewable diesel’s environmental benefit, a recent LCA study showed that biodiesel reduces GHG emissions by 72% including ILUC. As reported in the Digest in January, the Argonne National Laboratory, Purdue University, and the U.S. Department of Agriculture (USDA) study represents the most up-to-date and comprehensive lifecycle analysis of biodiesel ever produced. This study represents the first time Argonne National Laboratory has published a lifecycle assessment of biodiesel including indirect land use change (ILUC). The more the models reflect real world data, biodiesel’s benefits become even clearer. The improved model reduces ILUC emissions by more than 30 percent relative to the score adopted by CARB in 2015. Those are some impressive stats that can tempt any petroleum-based company to switch at least some of their facilities over to biodiesel. Add the fact that it is a drop-in fuel and you’ve got a win-win situation. By our estimates, we are talking about more than 1 billion gallons being converted recently from traditional diesel to drop-in renewable diesel out there, and with California’s mandate as well as others internationally, the demand alone for road transport, not counting jet fuel or marine and shipping fuel is significant. The demand is there and now it looks like the production is starting to catch up to meet that demand. More renewable diesel is still needed, however, so we anticipate seeing more announcements for renewable diesel expansions, new constructions, or conversions from petro-based diesel to biodiesel. After all, the times are a changin’.